We caught the buds in the trees and the daffodils blooming in Woodstock! This means that spring is upon us and many landscapers and homeowners are beginning the process of refreshing mulch or pine straw. Whether you are looking to spruce up flower beds, inclines, or the base of trees, it is helpful to follow simple guidelines in order for trees and plants to benefit. Space-When laying down fresh mulch or pine straw, it is helpful to leave about a 1 foot space between the base of the tree and the start of the mulch. Many homeowners place the mulch or pine straw right next to the tree. This invites extra water to sit and extra moisture can cause the tree trunk to begin rotting. It should not look like a cone when you are done. Organic-Mulch comes in many forms. 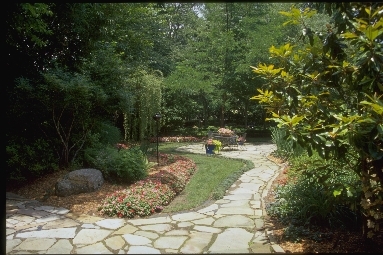 It is highly recommended that you use an organic mulch that is not composed of potentially harmful chemicals or dyes. Natural bark or pine straw mulch are both great natural options. Height-There should be no more than 2-4 inches of mulch or pine straw. A tall pile around the base of a tree can reduce the amount of oxygen to the roots. If you have questions regarding the health or growth of trees or plants in your yard, contact Hutcheson Horticultural Company. Our certified arborist on staff can assist with tree and plant disease identification. Contact us for a consultation today.